CETL’s Faculty Development Luncheon this month focused on ways to address topics related to race in the classroom. Members of the UM Critical Race Studies Group lead a panel discussion addressing issues about race and how they impact the classroom, particularly following recent high profile events which have sparked passionate reactions in the UM community and around the country. The panel included UM Professors Zack Kagan Guthrie, Heather Allen, Annie Cafer, Kirk Johnson, and Chuck Ross. Each of them discussed their approaches to addressing these issues within the contexts of their fields and classrooms. Dr. Johnson shared his belief that instructors can help students understand experiences of those who are different from themselves, and better understand each other. The panelists agreed, however, that class discussions, activities, and materials regarding race and race relations should fit the context of the class and promote academic discussions about these topics. They emphasized that class time should be devoted to learning experiences that support the purpose of a course. Following the FDL, the panel provided participants with the link to CRSG Resource Guide-Teaching Race in the Classroom, which includes suggestions and materials instructors can apply in their courses. CETL plans to sponsor additional events in the future to support faculty in exploring these topics. Dr. Josh Eyler, Director of the Center for Teaching Excellence at Rice University, lead this month’s FDL to discuss his research and his newly published book How humans learn: the science and stories behind effective college teaching. Eyler investigated research from various disciplines including anthropology, psychology, neuroscience, and education to inform his conclusions about students learning. He emphasized the importance of curiosity, emotion, and failure in learning endeavors. He advised instructors to consider these elements when choosing instructional techniques and activities for the classroom. If you are interested in perusing his book, please refer to CETL Learning Communities Bb course. The link to to the e-text is posted under the CETL Library tab. 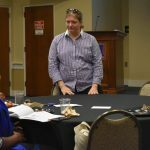 Josh Eyler, Director of CTE at Rice, joined several instructors at CETL’s FacChat for a conversation about practical classroom applications of his research. He suggested that instructors find ways to engage student curiosity in the content by allowing them some input about what to address in class or encouraging them to ask factual questions in order to generate more conceptual ones. He also suggested that instructors devise low stakes activities where students have opportunities to fail and to learn from those failures. 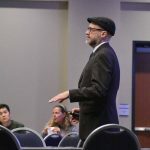 Finally, he emphasized that instructors should find ways to help students emotionally connect with content. Jami Mathewson, Director of Partnership at Wiki Education, joined us for our FDL this month to discuss teaching and learning opportunities via Widkipedia. Wikipedia is one of the world’s most widely read open educational resources. It has a broad public presence that is open for anyone to edit and offers people the unique opportunity to participate in an online community of practice. Faculty at numerous institutions use Wikipedia as a tool to teach students about research and writing. 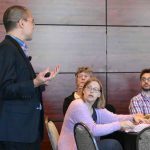 Wikipedia provides one way to support teaching and learning at UM with open educational resources. Jami Mathewson, Director of Partnership at Wiki Education, lead the afternoon’s FacChat to introduce the possible applications of Wikidata in UM classrooms. The newly established Wikidata offers faculty and students opportunities to assist with organizing information in order to build a database supporting Wikipedia and other wikis. Wikidata highlight another the way that open educational resources can support teaching and learning at UM. Dr. Deborah Goldberg (University of Michigan) visited our campus on Friday, February 15, to discuss University of Michigan’s ADVANCE Program, an NSF-funded program devoted to diversifying STEM. She focused specifically on ensuring diverse faculty populations at universities with strategies targeting searches and recruitment. As a member of the program’s STRIDE Committee, she collaborates with other senior faculty members to research best practices and conduct workshops for faculty serving on search committees. She emphasized that diversity strengthens campuses. A university must be deliberate and transparent in efforts to diversify its faculty. Please refer to her presentation slides for more details. University of North Carolina-Chapel Hill, spoke to faculty about using research on student learning when choosing methods to teach them. 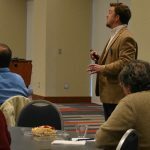 More than 70 UM faculty and staff located on the Oxford campus and UMMC Jackson campus (online) attended in the workshop. 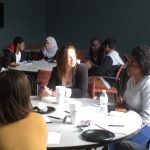 They participated in several small group and whole group activities and discussions focused on faculty experiences and concerns related to students. Dr. Zakrajsek advised faculty to vary in-class activities to mitigate cognitive load that students may experience when presented much information in a short period of time. Allowing students breaks during the instructional period in the form of active learning techniques, questioning, discussion, etc. gives them the opportunity to create connections between information presented in class to their own knowledge and experiences, which facilitates better learning. The last GIST seminar of 2018 focused on teaching philosophies and formulating teaching statements. Dr. Bob Cummings, Executive Director of Academic Innovation at UM, emphasized to graduate instructors the importance of articulating these beliefs and statements for not only employment applications, but also for evaluation and reflection of themselves as instructors. Graduate instructors engaged in a guided process to create their own teaching philosophies which connected their beliefs about teaching and learning with what their actions in the classroom. full day at UM in November discussing diversity-related issues in Higher Education, specifically in STEM fields. 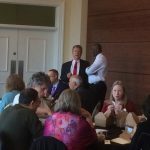 In addition to leading the monthly Faculty Development Luncheon, he met with administrators, faculty, and students about research and suggestions for promoting success of diverse populations in mathematics and the sciences. 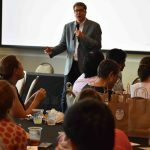 During the luncheon, he shared data concerning the low percentages of women and minorities in STEM Fields and led faculty in problem-solving activities related to managing classes to ensure inclusivity. Faculty who attended the luncheon rated Kung’s presentation highly and indicated their plans to apply his strategies in their courses. For October’s Graduates Instructors’ Seminar in Teaching (GIST), Susan Gaunt-Stearns guided graduate instructors in a backward design approach to organizing classes they plan to teach. Backward design starts with establishing the learning goals for the course and designing the learning objectives to align with those goals. Learning goals state the knowledge and skills students must demonstrate by the end of the course, and learning objectives are the knowledge and skills students must demonstrate after each lesson. Once the learning goals and learning objectives have been established, instructors can select assessments, content, and methods that best reflect them. The presentation materials and handout are included on Blackboard. Our next GIST November 29. CETL’s Faculty Development Luncheon this month highlighted UM’s effort to promote Open Educational Resources (OER). Dr. Bob Cummings, UM’s Executive Director of Academic Innovation and Mr. Chris Holder, Lumen’s Southeastern Executive Director, discussed the advantages of OER for both faculty and students. Faculty are allowed much more control over the content on which to build their courses. Students gain access to course materials without purchasing expensive textbooks. Dr. Cummings invited faculty to participate in the Z-Degree Initiative, a program that offers financial support to faculty desiring to incorporate OER into their courses. For more details, please see Open Educational Resources and Z-Degrees. Dr. Kellum speaking to a group about what they want to teach their students and how they want to teach them. 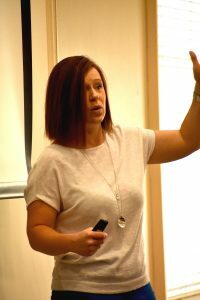 This month’s Graduate Instructors’ Seminar in Teaching was led by Dr. Karen Kellum an Associate Director of Institutional Research and Assessment, and Assistant Professor at the University of Mississippi. Dr. Kellum, whose research consists of Behavior Analysis and Educational Assessment, talked to a room of 23 graduate students who either are teaching or want to teach about how to engage their students in learning activities. According to Dr. Kellum, simply listening to a lecture and taking notes isn’t enough to help students learn the material. However, there is evidence that active learning activities orchestrated by the instructor, may help in a student’s ability to learn and meet class objectives. These activities can be anything from blogs, podcasts, or iMovie. Leadership and Growing Leaders with Dr. Tim Elmore; Growing Leaders, Inc.
Dr. Tim Elmore speaking to a room of 80 people about growing the next generation’s leaders. Dr. Tim Elmore is the founder and president of a non-profit organization that was created to develop emerging leaders. Founded in 2003, Growing Leaders encourages and equips young adults to take on real-life opportunities and challenges in the classroom, in their careers, and in the community. According to Dr. Elmore, this generation has a lot of anxiety. Students today have the same level of anxiety as a psychiatric patient did in the 1950s because they have a fear of messing up. They feel overwhelmed by the job market, by their parents, or even by their own competitiveness. They are over-connected and miserable at interpersonal skills because of their attachment to technology. They are also overprotected and therefore stunted in their ability to grow as adults. The solution to this dilemma is to find out which of their social or emotional muscles needs work and then helping them to develop those muscles. Sponsored by the Center for Excellence in Teaching and Learning with support from the Office of the Provost, the Graduate School, and Dr. Johnny Lott, the Graduate Instructor Excellence in Teaching Award was inaugurated in 2008 to recognize the importance of the teaching role performed by graduate students. The 2018 recipient of the Graduate Instructor Excellence in Teaching Award is Marissa Wyant. Marissa Wyant. In collaboration with the Graduate School, CETL conducted the annual Graduate Instructor/Teaching Assistant Training August 13-14. 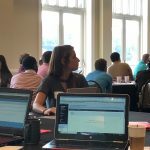 Over 72 graduate students representing 20 academic departments attended the half-day trainings, which included workshops related to Blackboard and teaching in addition to brief informational presentations about campus resources. The Supplemental Instruction (SI) Program welcomed 29 new SI Leaders to SI Leader Training August 15-17. All of these new leaders attended SI sessions as students, so they were familiar with the SI culture and the benefits that SI participation could provide. As a result, training could focus on active and collaborative demonstrations, simulations, and discussions about materials provided over the summer via Blackboard and to their own SI experiences. These SI Leaders join 9 others who are returning this year making this the largest SI Leader group in the program’s history. They will support over 15 courses in Accounting, Biology, Chemistry, Psychology, and Modern Languages. CETL’s Graduate Instructor Seminar on Teaching (GIST) focused on engaging students through active learning. Dr. Alice Steimle and Dr. Susan Gaunt-Stearns defined active learning and described its benefits to students. Active learning techniques encourage greater student participation and collaboration in class and increase student motivation to think critically about course content. Participants engaged in a series of reflective “think, pair, share” activities and were provided a number of active learning techniques to try in their classes. Finally, participant groups engaged in a sample activity used in Dr. Gaunt-Stearns’ own history class. Materials used in the seminar are posted on the Graduate Instructor Course on Blackboard. The next seminar is scheduled for Friday, April 27. Dr. Barry Maid, Professor and former head of Technical Communications at Arizona State University, lead CETL’s FDL in March. He addressed Threshold Concepts, perspectives that differentiate novices and professionals within a discipline. They highlight the transition from thinking like a Mathematics student, for example, to thinking like a Mathematician. Though these concepts vary by discipline, they share eight characteristics, all of which describe changes in a person’s thinking, language, and beliefs once he or she joins a community of researchers, practitioners, etc. Dr. Maid encouraged faculty to identify the Threshold Concepts applicable to their own fields and use them to augment program goals. The materials provided at the FDL are available in CETL Learning Communities on Blackboard. UM Professors Alan Gross, Kelly Wilson, and John Rimoldi led this month’s FacChat, which addressed promoting greater student autonomy in graduate programs. Though representing different disciplines, these recipients of the Excellence in Teaching and Mentoring Award agreed that helping graduate students build confidence throughout their programs contributes to their exhibiting greater autonomy. Strategies which they use involve ensuring that graduate students engage in tasks expected of professionals in their fields, e.g. grant writing, manuscript reviewing, etc. They also emphasize the importance of community within a graduate program. Team tasks, journal clubs, and research groups provide foundation for students to develop a broader supportive network throughout their graduate studies and beyond. Finally, they agreed that good mentors can help students correlate their experiences, good, bad, and ugly, with their development from graduate student to professional. By engaging in professionally oriented tasks, establishing good peer relationships, and actively reflecting on their experiences, graduate students build confidence and exhibit greater autonomy in their programs. Backward design model and provided materials with questions to guide instructors’ thoughts about courses they teach or plan to teach. The instructors appreciated the tips and suggestions about developing measurable goals and objectives, but one of the tips they especially appreciated related to the final exam. By creating the final exam while planning the course, instructors can reduce the stress traditionally attributed to ”end-of-semester frenzy” and improve the likelihood of their staying true to their course plans throughout the semester. The materials for this seminar are included on the Graduate Instructor Course on Blackboard. The next GIST event is scheduled for Friday, March 23. Graham Bodie (Journalism) lead CETL’s first FacChat of the semester. Elaborating on his presentation at CETL’s faculty development luncheon in October, he discussed practical classroom applications of the Listen First Model. 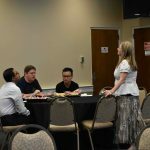 Several participants mentioned the difficulty in motivating students to engage in conversations involving controversial topics or to converse with those dissimilar from themselves. They highlighted factors that might contribute to students’ silence: fear, minimal confidence, and cultural norms. Perhaps some students wanted to avoid others’ expectations that they have an opinion. Dr. Bodie stressed the importance of preparing students for classroom conversations. 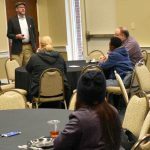 He offered several resources to help students and instructors develop a good “space” for good “conversations.” These resources are available in CETL Learning Communities on Blackboard. 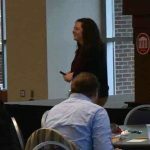 In lieu of the monthly faculty development luncheon, CETL collaborated with the Provost’s Office on UM’s 2018 Kickoff Event, a day with Linda Nilson, Director Emeritus of Clemson University’s Office of Teaching Effectiveness and Innovation. Dr. Nilson is a leading expert on critical thinking (CT), which is the focus of UM’s upcoming Quality Enhancement Plan (QEP). During her visit, she met with a variety of committees, administrators, and faculty to discuss her research and experiences related to CT initiatives on university campuses. The day culminated with her workshop, “Critical Thinking Unmasked,” where she summarized her research on CT and offered suggestions for promoting it in discipline-based courses. The handout for the workshop as well as materials from one of her CT webinars may be found in CETL Learning Communities on Blackboard. Matt Ohland (Purdue University) joined us in January to lead CETL’s 3rd Annual Winter Intersession Workshop. Despite icy roads and school closings, UM faculty, instructors, and administrators gathered for the two-day workshop to examine the instructional applications and research opportunities afforded by CATME, Comprehensive Assessment of Team Member Effectiveness. Participants left the workshop inspired to try or augment team-based approaches in their classes and to incorporate CATME. Presently, individual UM departments are licensed to use CATME, but given the interest generated by the workshop, CETL and The Division of Outreach are investigating the possibility for a university-wide license to allow broader access to this innovative tool. CETL scheduled its first monthly Graduate Instructor Seminar on Teaching (GIST) on January 26th. 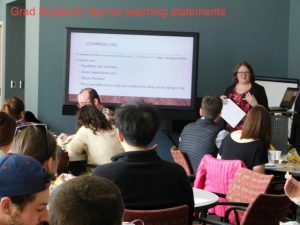 More than 45 graduate students attended to lunch and learn about the value of teaching statements for their careers in higher education. Ken Sufka (Psychology) and Lauren Reynolds (Modern Languages) provided tips on creating teaching statements, using them as a basis for reflection, and refining them to support academic job searches at different types of institutions, e.g. R1’s, community colleges, etc. They stressed that teaching beliefs are not static; they change with time, experience, students, and environments. They advised the graduate students to continually reflect and refine their teaching statements as they develop as instructors. Materials included in the seminar are posted on the Graduate Instructor Course on Blackboard. The next GIST Seminar is scheduled for Friday, February 23. Dr. Graham Bodie guides faculty through a “Listen First” collaborative activity. On Thursday, October 12, Dr. Graham Bodie lead our faculty development luncheon about The Role of Listening in Civil Discourse. He introduced the Listen First Model, its application in university classrooms, and responded to faculty questions. For a full description of Dr. Bodie’s presentation please see Better Learning Through Listening in the Classroom by Dr. Deb Wenger (Journalism).